A busy day for the stable with five runners at Caulfield on the first Group 1 meeting of the season in Melbourne. Play That Song kicks things off in race one, Tribal Wisdom in race three, Saracino in race six, Vengeur Masque in race eight and Yesterday’s Songs in race nine. Saracino has his first start for the stable since transferring from New Zealand however, Mike Moroney feels the four-year-old is far from suited by the conditions of the Group 3 The Heath over 1100m. “The problem is the weight - he’s not well weighted having to give Group One winners weight but it’s a good place to start him off heading into the Bobbie Lewis at Flemington in a couple of weeks time. “He’s drawn the outside but there are some scratchings so I’m not too concerned about that. Vengeur Masque runs in the Listed Heatherlie Stakes over 1700m and Moroney says racegoers will see a different horse when the import gets to the track. “He’s on the fresh side and still looks a little bit burly but I’m happy because he’s staring off the heaviest we have been able to get him since he arrived,” Moroney said. The Caulfield track is rated good(4) and Moroney is hoping the forecast rain arrives in time for race nine when Yesterday’s Songs runs in the Comcater Handicap over 1400m. 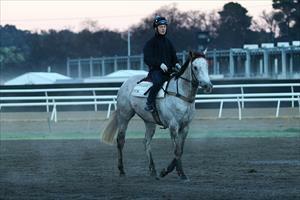 “It’s a pity because he looks well, continues to work well and has drawn well,” Moroney said. The track conditions are also important for Tribal Wisdom (pictured) in the Hocking Stuart Plate over 1200m. “It’s a very strong race but we are very happy with our horse,” Moroney said. “His work on Tuesday was terrific and he’s taken good improvement from his first-up run. The trip is ideal and if it did happen to rain it will help. Play That Song will be suited by stepping up to the 1400m of the Sheen Group Plate according to her trainer. “She’s drawn nicely for once so I’d like to see her bounce out and put herself on the pace,” Moroney said. “It’s only a small field so I can see it becoming a tactical race so I’m thinking it is going to be hard to make ground.